Akira Kurosawa | Level Up Fitness & Skills. Regarded by many, and rightly so, as one of the most influential filmmakers in cinematic history. His career, spanning from 1936 – 1993, working as director, screenwriter, producer and editor, Kurosawa has inspired the likes of George Lucas, Martin Scorsese, Steven Spielberg and Takeshi Kitano. He made his directorial debut in 1943 with the movie Sanshiro Sugata, (a.k.a Judo Saga), but his fame would not be cemented until five years later. 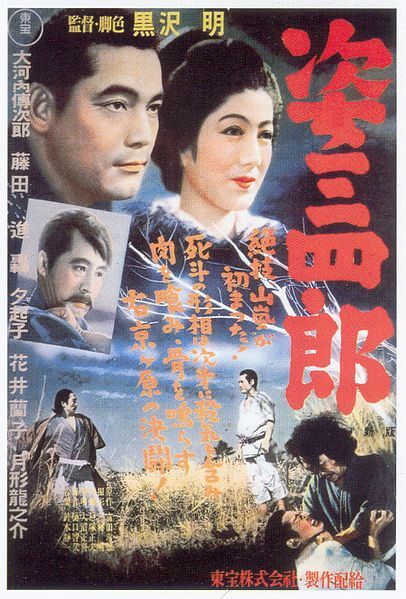 Movie poster for Sanshiro Sugata. In 1948 he collaborated with a then unknown actor, Toshiro Mifune, when he directed Drunken Angel. Mifune’s performance as a rebellious but critically ill gangster made Drunken Angel Kurosawa’s breakthrough film. The two men would go on to create 15 more movies together including: Seven Samurai, Yojimbo and Hidden Fortress. Rashomon, also starring Mifune, premiered in Tokyo in August 1950 and became, on September 10th 1951, the surprise winner of the Golden Lion at the Venice Film Festival, spurring it’s release in Europe and North America. Kurosawa’s commercial success with Rashomon opened up western film markets for the first time to the Japanese film industry. In all Kurosawa directed 30 films in a career spanning 57 years, and in 1990 he accepted the Academy Award for Lifetime Achievement. Born 23rd March 1910 in Ōmachi in the Ōmori district of Tokyo, Akira was the eighth and youngest child of Isamu and Shima Kurosawa. His family was moderately wealthy, his mother, Shima came form a merchant’s family in Osaka and his father, Isamu was a member of a former Samurai clan of the Akita prefecture. Kurosawa’s father played a pivotal role in his career choice. Isamu was very open to western traditions, a rare trait in Japanese citizens at that time, and encouraged a six-year-old Kurosawa to watch movies, as he considered both theatre and motion pictures to have educational merit. Unbeknownst to many, Kurosawa originally trained as a painter, his storyboards for all his films were full-scale paintings. 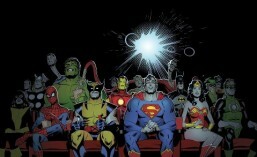 He would storyboard the whole movie like this. This painting is from Ran. At age 25 he finally entered the film industry in February 1936, when Photo Chemical Laboratories, (P.C.L. which later became Toho company), advertised for assistant directors. P.C.L required applicants to submit an essay discussing the fundamental deficiencies of Japanese films and ways to overcome them. Kurosawa’s essay mocked the question by suggesting that if the deficiencies were fundamental, they could not be corrected. The essay earned him follow-up exams; one of the examiners was respected director Kajirō Yamamoto, who insisted on hiring Kurosawa. In his five years as assistant director, 17 of his 24 films were made working with Yamamoto, earning him swift promotion straight from 3rd assistant director to chief assistant director within one year. The last movie they worked on together was Uma, (Horse), 1941. Kurosawa took over most of the production as Yamamoto’s attention was focused on another project. In 1942 Kurosawa found the inspiration for his directorial debut in Tsuneo Tomita’s novel Sanshiro Sugata. After devouring the book in one sitting on its publication day, he asked Toho to secure the film rights, a solid prediction on his part as soon after many other film companies were vying for them. He encountered great difficulty releasing the movie as the censors considered it too ‘British – American’, which at that time was as severe an accusation as treason. The censorship office eventually allowed it to be screened but not before cutting around 18 minutes of footage, most of which is now forever lost. Despite these obstacles and setbacks the movie became a critical and commercial success. It was during the filming of the next movie, The Most Beautiful, a semi-documentary propaganda film about female factory workers, that he met Yōko Yaguchi. Yōko was the lead actress and constantly at odds with Kurosawa’s filming methods. In order to get the best performance, he had all the cast live in a real factory, eat real factory food and only address each other by their character names. He used this method throughout his career to great effect. It was these arguments that built a lasting relationship, and on May 21st 1945 they married. Toho in the meantime, had become increasingly concerned with the growing scope and budget requirements of Kurosawa’s movies. Toho suggested he help finance his own works, thereby limiting any of the studio’s potential losses and allowing him more artistic freedom. He agreed and in April 1959 the Kurosawa Production Company was born, Toho being a majority shareholder. 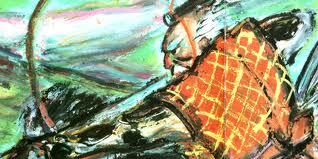 April 1961 saw the release of Kurosawa Productions second film Yojimbo. The movie played on many genre conventions, particularly the Western and was an immense box office success. Yojimbo ushered in a new era of violent Samurai films known as Zankoku Eiga or ‘cruel films’. Its influence spread worldwide and was virtually remade scene-by-scene as Sergio Leone’s A Fistful of Dollars. A true classic and one of Mifune’s finest performances. After such success, Toho pressured Kurosawa into releasing a sequel, thus he reworked Yojimbo’s hero into Sanjuro. Sanjuro would be the first of three movies adapted by Kurosawa from the writings of Shūgorō Yamamoto, the other two being Red Beard and Dodeskaden. 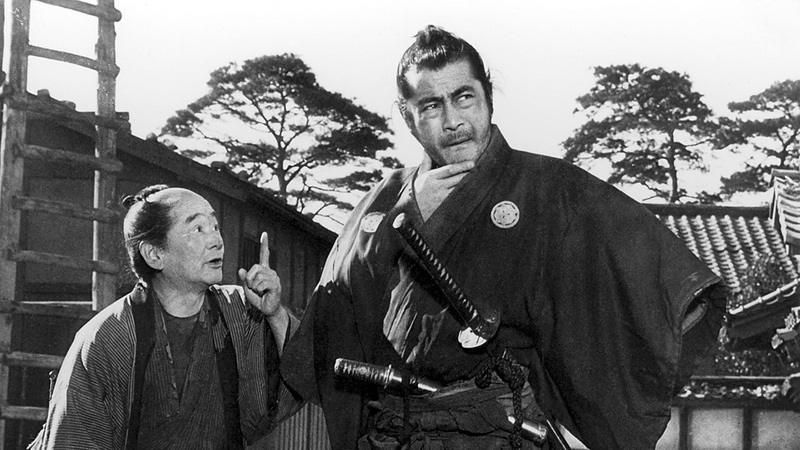 Sanjuro surpassed even Yojimbo’s success in the box office in January 1962. Kurosawa’s greatness continues to inspire writers and directors of this era and will undoubtedly continue to influence the movie industry for many years to come. Without Hidden Fortress there would probably be no Star Wars. Kurosawa counted Fyodor Dostoyevsky, Maxim Gordy, William Shakespeare and Kenji Mizoguchi among his influences. He also wanted to make a Godzilla movie. Imagine how awesome that would’ve been. 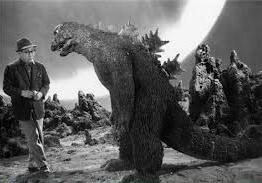 The main man himself, sizing-up Gojira. This entry was posted in Movies, Film & Cinema. and tagged (five), (Horse), 3rd assistant director, A true classic, Akira Kurosawa, Akita prefecture., artistic freedom, Asian of the Century, Asian Week magazine, assistant director, British – American’, censors, chief assistant director, cinematic history, CNN, critical and commercial success, cruel films, director, directorial debut in 1943, Dodeskaden, Drunken Angel, editor, educational merit, female factory workers, film companies, finance his own works, former Samurai clan, full-scale paintings., Fyodor Dostoyevsky, genre conventions, George Lucas, godzilla, Godzilla movie, Gojira., Golden Lion, greatest contributors to the betterment of Asia in the past 100 years., growing scope and budget, immense box office success, Isamu, Japanese film industry, Japanese films, Judo Saga, Kajirō Yamamoto, Kenji Mizoguchi, Kurosawa, Kurosawa directed 30 films, Kurosawa originally trained as a painter, Kurosawa Production Company, Kurosawa Productions, Kurosawa’s essay, Kurosawa’s filming methods, Kurosawa’s greatness, Kurosawa’s movies, lead actress, Martin Scorsese, Maxim Gordy, merchant’s family in Osaka, movie industry, Movie poster for Sanshiro Sugata., neighbourhood Rogue Advisor, One of the, Osaka, P.C.L, Photo Chemical Laboratories, potential losses, producer, Ran., Rashomon, Red Beard, remade scene-by-scene, Rogue Advisor, Sanjuro, sanshiro sugata, screenwriter, secure the film rights, semi-documentary propaganda film, Sergio Leone’s A Fistful of Dollars, Seven Samurai, Shima, Shūgorō Yamamoto, Steven Spielberg, storyboards, swift promotion, the Academy Award for Lifetime Achievement, The Most Beautiful, the Western, Toho, toshiro mifune, Tsuneo Tomita’s, Uma, venice film festival, violent Samurai films, western traditions, William Shakespeare, Without Hidden Fortress there would probably be no Star Wars, working with Yamamoto, writers and directors, Yojimbo, Yōko Yaguchi, Zankoku Eiga. Bookmark the permalink.